LINCOLN, NE—The Nebraska Corn Growers Association and Nebraska Grain Sorghum Producers Association are urging farmers to submit comments to the U.S. Environmental Protection Agency (EPA), on their proposed reduction of acceptable application levels for atrazine, a herbicide used for weed control in growing corn, sorghum and other crops. For more than 50 years, Atrazine has been a mainstay of corn and sorghum farmers for its proven control of a broad range of weeds. That is why the Nebraska’s Corn and Sorghum Associations are strongly encouraging Nebraska farmers to contact the EPA and express their disapproval of their ecological risk assessment for atrazine. If the recommendations included within the assessment stand, it would effectively render this important tool useless on farms and significantly increase farmers input costs. EPA is accepting public comments on the assessment through October 4, 2016. In a joint statement, Nebraska Corn and Sorghum leaders expressed great disappointment and concern regarding the EPA’s recently released ecological risk assessment on the herbicide. “In spite of more than 7,000 scientific studies proving atrazine’s safety, the EPA chose to ignore sound science and is proposing to drastically reduce the use of one of the most reliable herbicides available,” added Mussack. The EPA based their ecological risk assessment for atrazine on studies their own Science Advisory Panel deemed ‘flawed’ just 4 years ago. Through the use of these highly questionable studies, the EPA arrived at an aquatic level of concern for Atrazine of 3.4 parts per billion, a two-thirds reduction from the current level of 10. Scientific evidence points to a safe aquatic life level of concern at 25 parts per billion or greater. If the proposed level of concern becomes the standard, effective use of the herbicide would be unachievable and would ultimately represent a de facto ban on the use of atrazine. Farmers can take action on this issue and submit a comment to the EPA by visiting the website: FightEPA.org. The website will directly link you to a comment submission form with suggested verbiage. Additionally, farmers will be able to directly submit comments to the EPA and learn more about this issue from Nebraska Corn and Sorghum Associations leaders in the commodities building during Husker Harvest Days. Nebraska Grain Sorghum Producers Association: the voice of the sorghum industry. Nebraska Grain Sorghum Producers represent sorghum growers through legislative and regulatory advocacy and educational outreach. The Nebraska Corn Growers Association (NeCGA) has closed the books on this summer tradition fueled by American Ethanol. 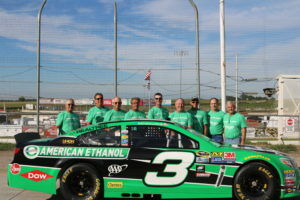 This summer six different speedways played host to American Ethanol Night at the Races sponsored in part by Nebraska Corn. Local corn grower associations and Nebraska Corn staff had a fun summer talking with race fans about the benefits of homegrown American Ethanol. The races kicked off on Saturday, June 11th at Junction Motor Speedway in McCool Junction with a great turnout of locals and race fans. The event was hosted by the York County Corn Growers and Blue River Corn Growers Associations. Next, it was time to race over to US 30 Speedway near Columbus on Thursday, June 16th. Since one race in a weekend is not enough, staff and local volunteers headed to Boone County Raceway in Albion on Friday, June 17th. 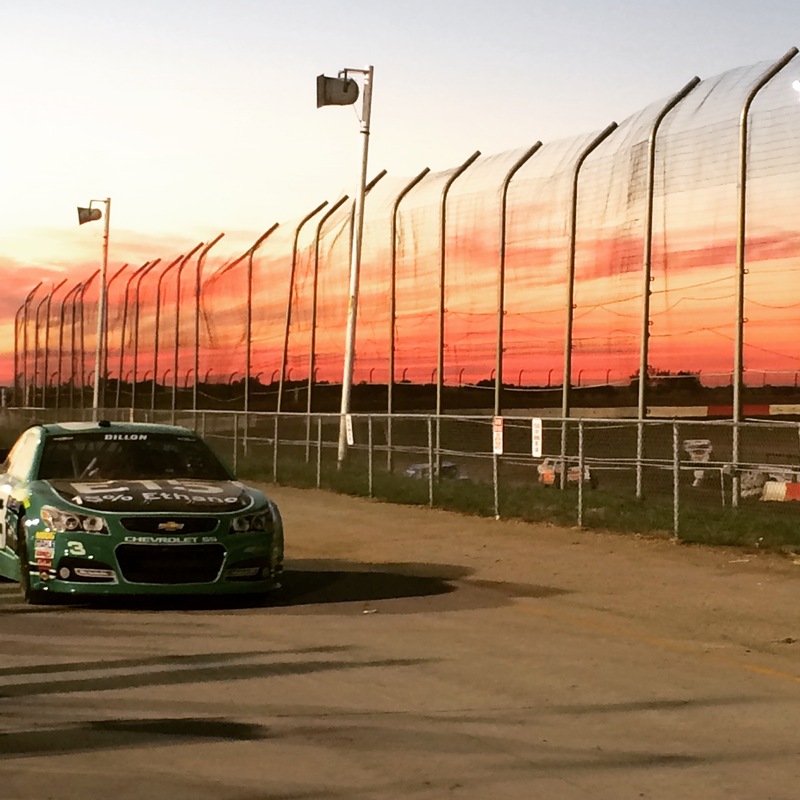 Both of these tracks were first time locations for American Ethanol Nights at the Races. 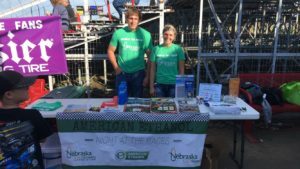 Staff and volunteers had great opportunities to talk with race goers about American Ethanol and Nebraska corn. These races were hosted by the Central Plains Corn Growers Association. Sunday, June 19th at Lexington Raceway in Lexington was another great night fueled by American Ethanol. Volunteers from the Dawson County, Custer County, and South Central Corn Growers were on hand to talk with race fans as they entered the gates. The locals were also the hosts for this race. A special event happened on Friday, July 15th at I-80 Speedway near Greenwood. Austin Dillon’s American Ethanol show car made an appearance at the track. I-80 Speedway was a packed house as locals, staff, and fans came out to enjoy the races and check out the car. This race was hosted b y the Saunders County Corn Growers Association. 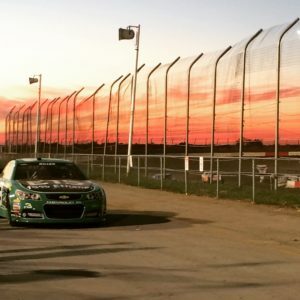 The summer series wrapped up on Friday, August 12th at Beatrice Speedway in Beatrice. This was a great race to finish off the summer with as locals, staff, and fans came out to watch the modified madness. This race was hosted by the Southeast Corn Growers Association. 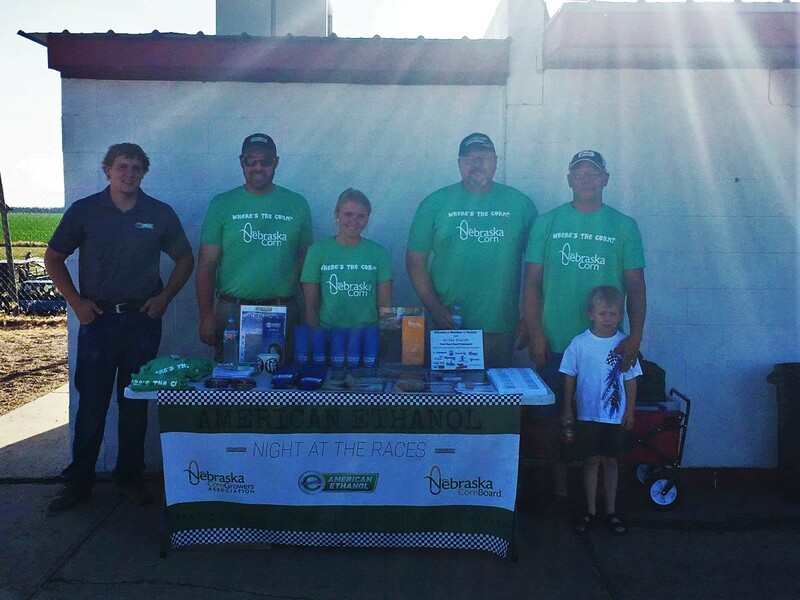 local corn growers, family, and friends, to get together on a fun night and help promote homegrown fuel. American Ethanol helps promote cleaner air for our environment, creates job opportunities in rural communities, and is an industry supported by Nebraska corn farmers. The 2016 Corn Grower Open is in the books and we are thankful for another fun and successful day of golf! We had over 110 golfers and nearly perfect weather at the York Country Club. The winner of flight 1 was a tie between the AgriGold team and the Buffalo-Hall (Rohrich) team and the winner of flight 2 was the team from Wilbur-Ellis. NeCGA Board Member, Deb Gangiwish, was the lucky winner of the Valley raffle and took home a Valley branded putter. NeCGA wants to give a big thank you to all of the sponsors, golfers, and members who came out to enjoy the day with us. Without you, the tournament would not be possible. Thank you again and we are looking forward to seeing you on the course next year!